Available in trade paperback for the first time, a collection of cult sensation Jeremy Robert Johnson's best and most bizarre short fiction, including a brand-new, never-before-published novella. 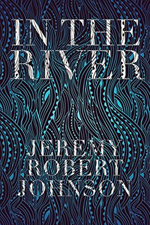 For more than a decade, Jeremy Robert Johnson has been bubbling under the surface of both literary and genre fiction. His short stories present a brilliantly dark and audaciously weird realm where cosmic nightmares collide with all-too-human characters and apocalypses of all shapes and sizes loom ominously. In "Persistence Hunting," a lonely distance runner is seduced into a brutal life of crime with an ever-narrowing path for escape. In "When Susurrus Stirs," an unlucky pacifist must stop a horrifying parasite from turning his body into a sentient hive. Running through all of Johnson's work is a hallucinatory vision and deeply-felt empathy, earning the author a reputation as one of today's most daring and thrilling writers. Featuring the best of his independently-published short fiction, as well as an exclusive, never-before-published novella "The Sleep of Judges"―where a father's fight against the denizens of a drug den becomes a mind-bending suburban nightmare―Entropy in Bloom is a perfect compendium for avid fans and an ideal entry point for adventurous readers seeking the humor, heartbreak, and terror of JRJ's strange new worlds. 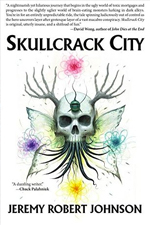 "A perfect place to get acquainted with one of the darkest stars in the genre...Johnson captures humanity's absurdity, our grotesqueries, sometimes our triumphs, all the while pushing past the limits of reality, transforming it into something dark, and surreal, and unforgettable." 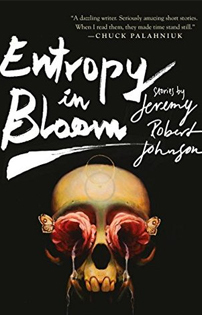 "ENTROPY IN BLOOM is an instant classic, a carefully curated manifesto whose main goal is to tell the world one of the brightest stars in indie lit is now too brilliant to remain hidden...This collection should turn him into the writer everyone is talking about. These fifteen stories and one novella show a powerful imagination, a great talent for storytelling, writing chops that allow him to tackle any genre, and a flowing, dynamic voice that, if Johnson were a singer, would extend to an impressive eight octaves." "Surreal, visceral, and frequently unsettling...One more descriptor, while we're at it: highly entertaining. Johnson brings a pulpy urgency to the page, which blends neatly with the frequently heady concepts that he utilizes in his fiction. 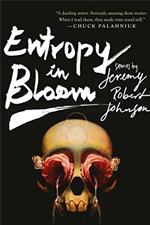 [ENTROPY IN BLOOM]'s a fine primer to his work, which encompasses everything from stories of pernicious terrors working their way into the world to taut crime fiction to insightful character studies." "These stories can be uncomfortable, difficult, unflinching, but they're also always entertaining. Johnson writes with an energy that propels you through some very dark spaces indeed and into something profoundly unsettling but nonetheless human." "ENTROPY IN BLOOM crackles with weirdness, style, wit, a befittingly oddball sense of humanity, and a misshapen dark heart. I loved every damn story." "Reading Johnson, you feel you are in the grip of an immensely powerful, possibly malevolent, but fiercely intelligent mind. Beware! (But enjoy--and trust me, you will.)"